Christmas is a time for fun, family and happiness. But too often, it can be spoiled by accidents or problems around the home that could have been easily avoided by making a few simple checks or taking some preventative measures. Let’s take a look at some of the easiest ways you can keep your home and family safe this Christmas. While they can give a lovely ambience and fragrance to the home, they are naked flames and care must be taken to ensure they stay safe. Never leave them unattended and make sure that they are kept well away from any tinsel or other decorations. Make sure they are fully extinguished before leaving the home or going to bed. Don’t overload electrical sockets – with so many lights and other decorations being brought out for the festive season, demand for sockets around the home will be high. Make sure you are using approved extension cables or multi-sockets. They are easily purchased from DIY retailers and are not expensive. If you are using outside lights or decorations, always use an extension cable that has been approved for external use. You should also use a Residual Current Device (RCD) which will help prevent the risk of electrocution if the external wires are damaged in any way. According to RoSPA, about 1000 people are injured each year while putting up the festive decorations. Be sensible when decorating – don’t stand on a wobbly chair to get the star on top of the tree, take the time to get the stepladder out and make sure someone holds it safely while you trim the tree. It might take you ten minutes longer, but those ten minutes might save you a trip to A&E! Christmas lunch is probably the biggest, most important meal we cook each year, and it can certainly be the most stressful! Keep children and animals out of the kitchen if possible, as there will be lots of hot pots, pans and sharp knives around that could cause a problem. Food poisoning can be a concern so make sure you read the instructions on your turkey carefully and both defrost it fully and make sure it is completely cooked before you tuck in. Obviously, these examples are all worst case scenarios but, unfortunately, accidents do happen. 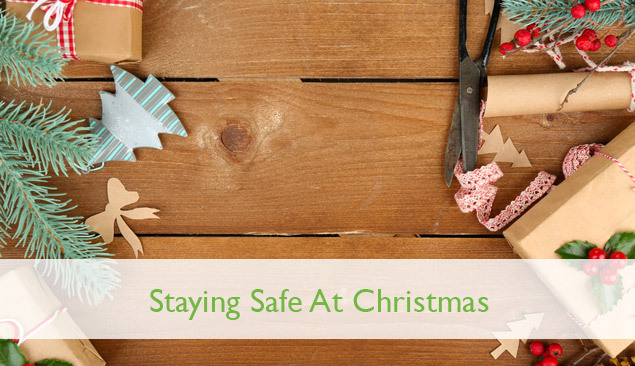 Hopefully, following these simple tips will keep you, your family and your friends safe over the holiday period. Wherever you are and whatever you do, we’d like to wish you all a safe and very Merry Christmas from everyone at Eco Movers!